The French Bulldog is not the average Bulldog. They are smaller in size and they are lapdogs that have a very quirky personality. Like most other lapdogs, they do enjoy affection from their owners and will adore sitting on their laps and feeling comforted. They are natural crowd pleasers, and very simple to care for. 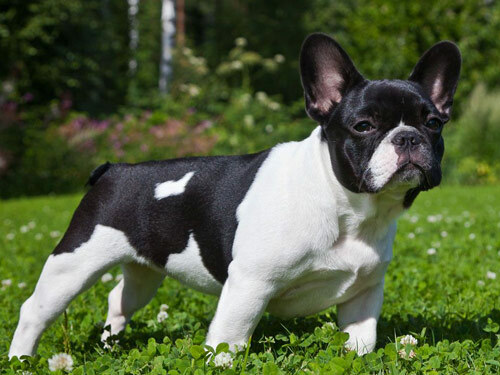 Very sweet and lovable little creatures, the French Bulldog will be a family favorite! For a smaller dog, the French Bulldog is great for an older owner. They are very playful, but they do not need a lot of activity to keep them happy. A walk or small amount of time playing in the yard will be just fine for them. They do not adapt well to very warm weather conditions and they are not well known for being excellent swimmers. Like most lapdogs, this breed does snore when they sleep and some may even drool as well. They can adapt better to colder climates, but still should never reside outdoors and always in an indoor environment. They have an easy to care for fur coat that will only require the normal brushing, but they will need some attention paid to their facial wrinkles. Some health issues that may progress with a French Bulldog are CHD, allergies, intervertebral disk disease, brachycephalic syndrome, elongated soft palate and stenotic nares. In some cases they may also experience hemivertebra and patellar luxation. Distichiasis has also been noted in some French Bulldogs. The vet may recommend screening on their hips, spine, knees and for their eyesight as well. When the French Bulldog females become mothers, often they require a cesarean section delivery. They are also a breed that has difficulty with anesthesia and they do not adapt well to very warm temperatures either. The average lifespan for a French Bulldog is between nine and eleven years long with an average weight reaching twenty eight pounds as full grown dogs. Originating in France sometime in the 18th century, the French Bulldog was extremely popular in England. In those times, many workers would tote their mini Bulldogs along with them on a workday, with women being more fond of them than the men. They were known as the Bouledogue Francais in France and many of those that were in a wealthy social class favored them. The English population enjoyed their Bulldog traits in such a small package, but they did not prefer their perky ears. They were known as bat ears and this was not a good look in the UK for canines. In the end of the 18th century American citizens began to transport these dogs to the United States where they grew in popularity. The Americans developed their own dog show just with this breed in mind and opened a club featuring this breed in 1898. By the early 1900's, they were one of the most popular choices in dog shows and have since maintained their status as a common family lapdog.